Zero Month is here! 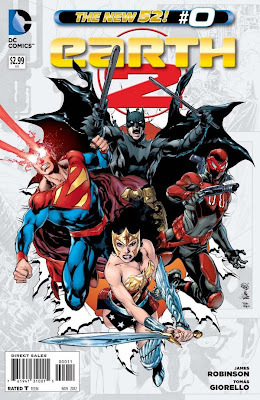 DC Comics, in celebration of the first full year of the New 52, has decided that all of their titles this month will be released as Issue #0 and feature origins, secrets and other tantalizing nuggets for us, their faithful readers, to enjoy! I have to say, I started collecting comics again with the start of the New 52 and it's brought a little happiness into my life every day since! What started as a Jedi mind trick to help me quit smoking has become a hobby I love! 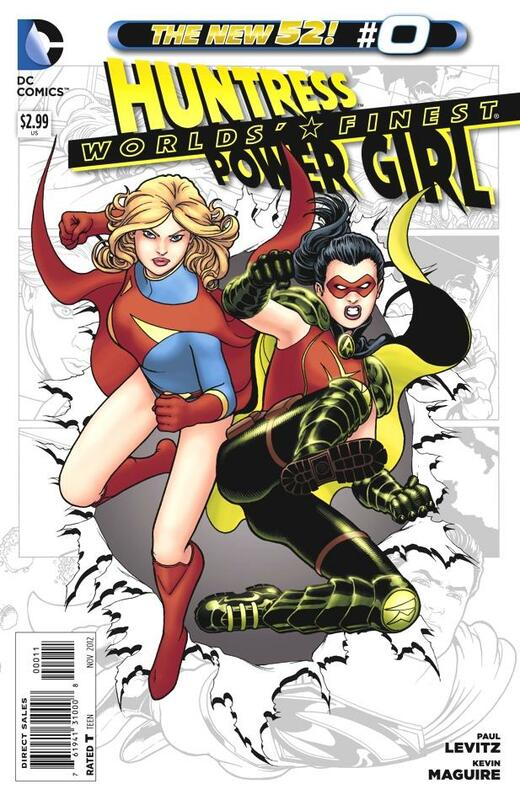 It still amazes me that something that cost me only 3 lousy bucks can mean so much, but hey...comic books! There you have it! So for me at least, the one year anniversary of the New 52 truly is worth celebrating! But enough of that...let's get down to business! Green Lantern #0 - "Simon Baz of Earth. You have the ERROR ability to overcome great fear. " 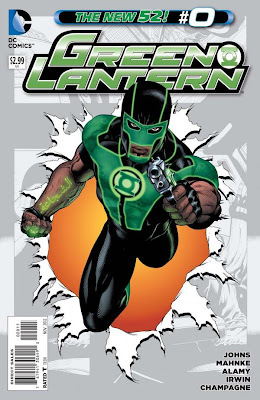 In what is perhaps the only Zero issue set in the present, we get to meet new Green Lantern Simon Baz for the first time this month! The reintegrated ring(s) of Hal Jordan and Sinestro find our new guy deep inside some secret military prison where he is being interrogated on suspicion of being a terrorist! Oh, America... To be fair, Simon IS a criminal. A car thief with a record of illegal street racing. He just happened to steal a van with a bomb in it this time...You can see why the feds are skeptical as he proclaims his innocence. Action Comics, Detective Comics, some Before Watchmen and a NEW comic after the JUMP! NEW! The Phantom Stranger #0 - "It is nothing. For I am...just a Stranger." The Phantom Stranger gets his own ongoing New 52 title and origin story starting this month! Before reading this comic, I knew almost nothing about the character, except that he's very mysterious and looks cool. Now I also know that the Stranger is one of the "Trinity of Sin" along with Pandora (whom you may remember was instrumental in creating the New 52 Universe, as well as famous for opening a box and letting evil enter the world) and another man, who's identity is yet to be revealed. These three are called the "Greatest transgressors mankind has ever known," and are given penance to fit their crimes. 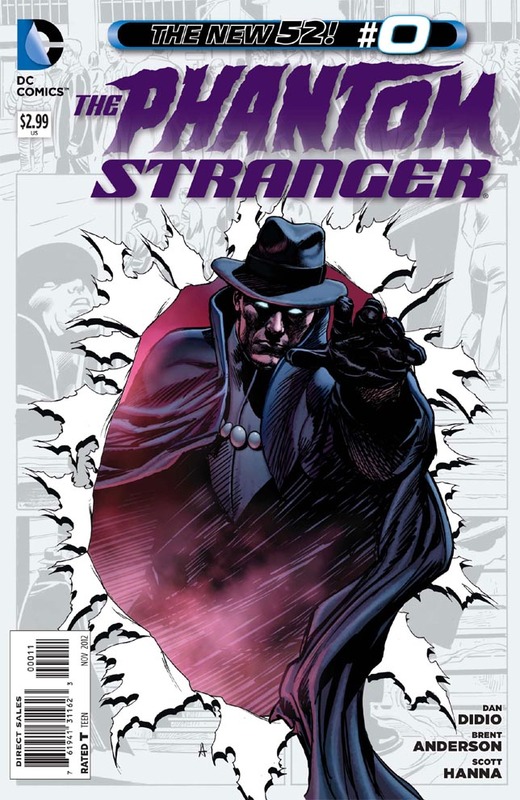 The Phantom Stranger is made to walk the Earth observing and occasionally hearing a call to take an interest in someone or other and thus "serve the greater good." In this way, one of the silver coins from his necklace can be removed. When all are gone, only then can he move on. All of that, and we also get an origin for The Spectre thrown in! Oh, incidentally, it's incredibly obvious to ME who the Stranger was in life. I don't know if it's supposed to be a huge mystery, but if so, I'm certainly not going to spoil it...go read the book and you tell me who you think he really is! 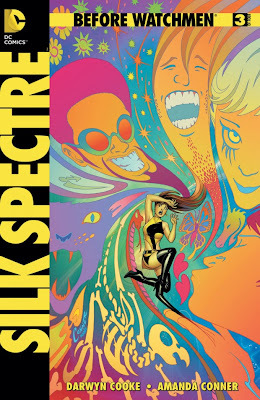 Before Watchmen: Silk Specter #3 (of 4) - This issue of Before Watchmen is my favourite yet. It just clicks with me on every level. The artwork and story merge together to perfectly express the thoughts running through Laurie's head as she starts the issue flying high on an acid trip at a party her roommates are throwing. Of course, this is tainted acid designed to somehow make teenagers spend more money, and it's fairly certain that tragedy is about to ensue. Really, if there wasn't near-constant tragedy, it wouldn't be The Watchmen, would it? There's no one element to this book that I can really point to and say "and that's why it's awesome! ", I just really dig on everything in this comic. It's a great "innocence lost" sort of tale. I will say that the facial expressions are phenomenal! Also, the cameo by the Comedian is pretty cool. We learn the origin of his happy face button! 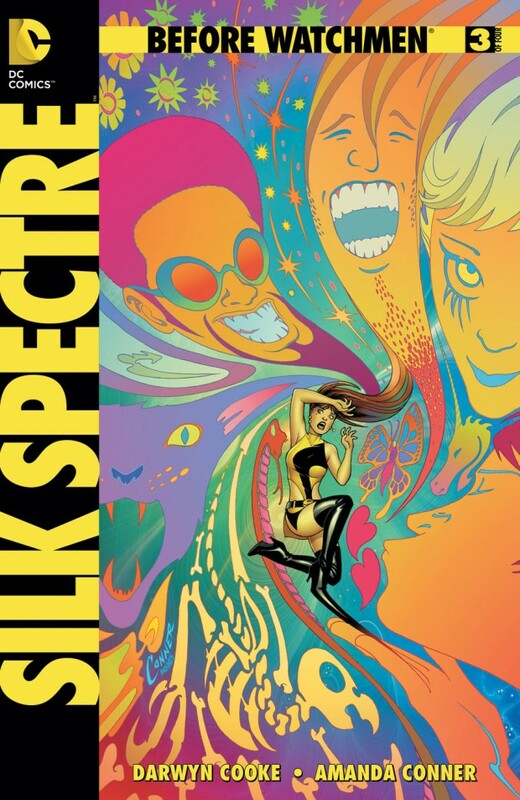 I'm actually sad that the next issue of Silk Spectre is the last...with a book this good, I'd love to see it keep going. That is NOT something I'd say about most BW titles, but in this case, they earned it! 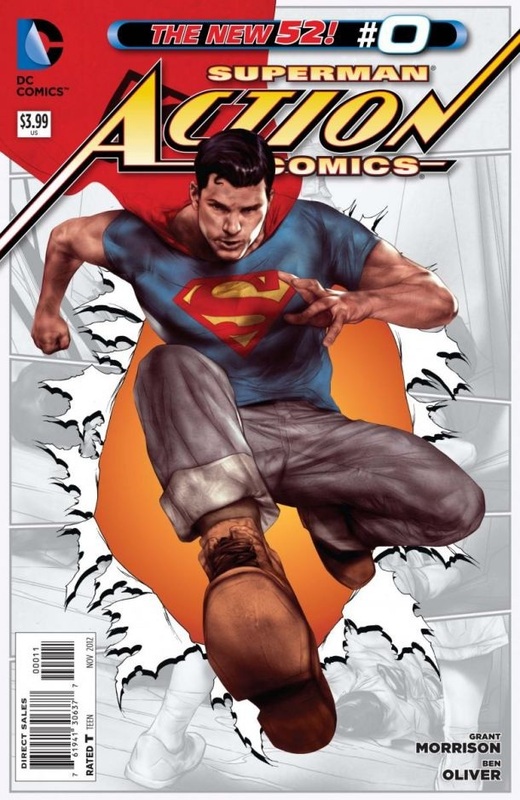 Action Comics #0 - "Can I ask you somethin' Mister? What does the "S" stand for?" We get to go right back to the start and experience Clark's first day in Metropolis this issue, as well as his debut as Superman! There are tons of hints for the future and little references sprinkled throughout this actually quite charming story entitled "The Boy Who Stole Superman's Cape". I love that these early adventures really showcase the characters' humanity. It makes them seem more real to see the progression from what they were to what they are and what they will eventually become! Of course it doesn't hurt that the comic is also really beautifully drawn and painted. How can you say no to that? Detective Comics #0 - "You are greater than flesh and bone. Greater than ice and blood, cold and heat, earth or sky. You are indomitable." Ten years ago, Bruce Wayne climbed to the top of a mountain somewhere in the Himalayas where he finds a Zen-Buddhist Monk Warrior who accepts him as a student in his quest to become something more than human....although what that will be, he does not yet know. This is the story of his final lesson with this, apparently his last teacher. It is a tale both harrowing and sorrowful, as Bruce both flirts with and struggles against his ultimate destiny. 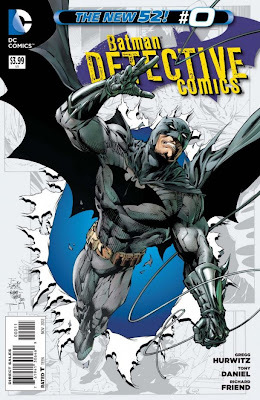 Not to be outdone, the back-up story showcases Alfred Pennyworth and his struggle to keep Wayne Manor and the Wayne family fortune out of the hands of Martha Wayne's relatives while Bruce is "missing" overseas. The Kane/Shaw family really want that extra wealth! Of course, they may not know just who they are dealing with! Earth 2 #0 - "If the world is weak, I will make it strong. I will save it from itself." Mr. 8 believes he is acting for the greater good. However, a true hero knows that the ends never justify the means. Particularly when the means, in this case, are unspeakably horrible! It's not ALL bad, though. We do get to see both the girls in training exercises with their mentors before, you know, everything goes to hell in a hand basket. In some way, it's actually sweet! Of course, that just reinforces the sense of loss the characters, and surely the reader as well, must feel by the end...I guess all this tragedy builds character...we can only hope! Green Arrow #0 - "I need to make things right. One arrow at a time." 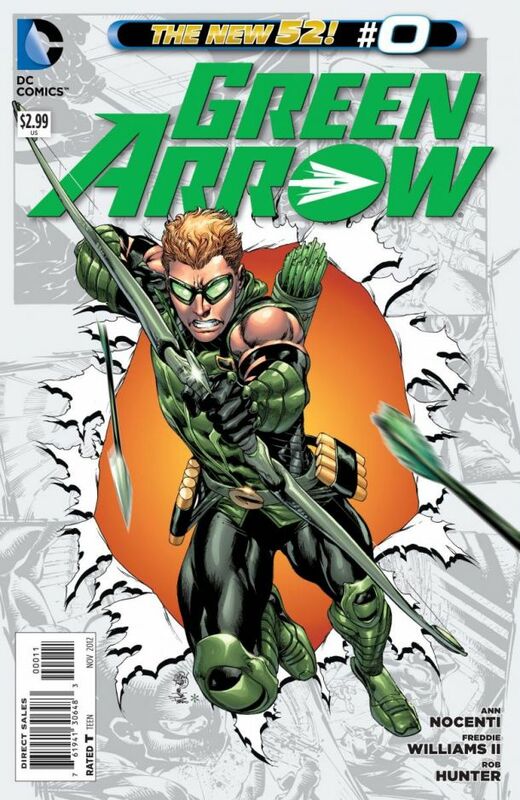 Oliver Queen wasn't always the pompous, stubborn, reckless vigilante whom I love to hate! Before he became Green Arrow, he was just the pompous, stubborn, reckless son of a billionaire industrialist who liked to throw week-long parties on oil rigs and rebel against anything that smacks of responsibility. This does NOT work out well for him (gee who would have guessed?). Well, perhaps it does, as it leaves him stranded on a tropical isle after an oil rig explosion he inadvertently causes. Of course, some industrial oil thieves also play a part. At least on the island he has a chance to practice with his bow! Oh, Arsenal aka Roy Harper aka "the smart one from Red Hood and the Outlaws" also makes an appearance this issue! There's a relationship I'd like to see explored further...we know so little about it in the New 52. So that's it for week one of Zero Month! Join me next time for Batman, Batgirl, Superboy, Batman and Robin, and more! Support your local comic book store! If you ever wondered what sorts of random nonsense go through my head when they give me time off work, check out Stryder's Dementia this week, as I wrote some of it down while on vacation last week! So hey, as the speech impaired pig told multitudes of children worldwide...That's all folks!